When I saw that readers who enjoy Murakami and Atwood would likely enjoy this book, I knew I had to give it a try. It's a great choice for book groups with plenty to discuss. After being out of work for way too long Joseph and Josephine, a 30-something couple move to an unnamed city from the "hinterlands" where Joseph has just found a job. Soon after Josephine is hired as an administrative assistant but, her job and the workplace is anything but ideal. Josephine's office is a windowless, dingy pink room (9997) with bright fluorescent lighting. Her faceless, boss, known only as, "The Person with the Bad Breath" provides her with files and instructions, Strictly data entry work, file after file she dutifully enters a series of numbers from the files into a database. She is not allowed to ask questions or discuss her job with anyone. She can't even hang a calendar on her disgusting office walls. Then there's a girl named Trishiffany who calls her JoJo and who knows way too much personal information about Josephine, information that she's pretty sure she has never shared. It gets more creepy and bizarre from there. Josephine's happy that at the end of the day she at least has her husband and the latest horrible place they call home to look forward to. However, when Joseph doesn't come home one night and then when he does return he becomes more distant, Josephine's anxiety kicks into high gear. She thought their relationship was solid and that she could count on him and they silly routines and word games. The story is told from Josephine's POV, and although it's a novel fewer than 200 pages, there's plenty to like about this story. A blend of real and surreal, touching and thrilling and with a good dose of dark humor, The Beautiful Bureaucrat will make you smile and make you wonder. The ending was unexpected and honestly it made me go back and read some of the story again. A good choice for book groups to consider. Labels: 4.5 star books, Henry Holt & Co. I am looking forward to reading this one. It sounds very intriguing and many seem to love it. I like something different from time to time and this fit the bill. It's on my wish list.. glad to hear you liked it so much! It's short and fun JoAnn. I loved this one and convinced my neighbor's book club to read it...so, I agree there's lots to discuss! The Socratic Salon had a great discussion about it too. I was drawn to this book because of its cover but then I read some so-so reviews. I'm glad to see you liked it because we generally have similar taste in books. Oh it was fun Kathy. That sounds good, and I usually don't like bureaucrats! LOL - I hear ya Brian. It sounds intriguing. I would like to read this one. Thanks Diane. 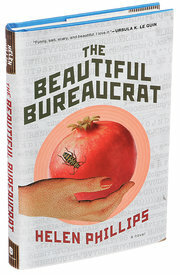 As a "bureaucrat" myself, I've been interested in this one, I just haven't had the time. It sounds great.